You all know that I am gardening obsessed. Okay, lets put the cards on the table. A gardening nut. My plants are just like children to me. I worry when they wilt. Bite my nails when they turn yellow. And become outraged when they are hopelessly attacked by beetles. Do you feel the same way about your garden? If so, you, my friend, are a gardening nut. Join the clan. The aim of my “show and tell” is to inspire you to grow more vegetables and/or to share your triumphs and losses. In turn, I also hope you will reciprocate and upload pictures and videos to Green Talk’s Facebook Fan page! Rather listen to me walk you through the garden. I got you covered with a video of one of my gardening sections. Truth be told, I actual filmed both garden sections but the original video would have been too long (except for me, who can’t get enough of my garden.) So, I cut it in half and if you twist my arm, I will feature the second half this week. As many of you know, I have a large garden complete with apples, pears, buckwheat, raspberry, and blueberry bushes. In my 21 raised garden beds, I grow heirloom vegetables. The video below is of the back garden which consists of 12 raised garden beds. (Want to know how to make raised beds easy peezy and inexpensively? Read here.) Just to give you a hint, the video shows my squash (um giant leaves,) amaranth (super grain,) tomatoes, cosmos, lima beans and more. Special treat: my first heirloom organic apples! Yes, we are so proud that we are expecting! Out of Control Flower/Herb Bed. My Life in A Bed? Do you think your planting beds mirror your life? My beds do. As you can see, this bed is over run with flowers. 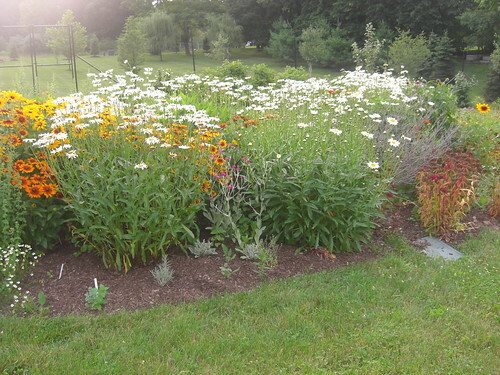 Shasta Daisies, Rudbeckia, Tarragon, Rue, etc. The white Shasta Daisies and yellow/orange Rudbeckia are so beautiful together. So, I guess be careful where you plant Rudbeckia and Shasta Daisies since they will take over. Do you have a bed like this which is over-run with flowers? Will I have to separate them next year so they don’t kill each other? Or can they live harmoniously, crowded? Knee High by July. Wait This Isn’t Corn? No, this isn’t corn. It is sorghum and when fully grown, it will be about 8 feet tall. I use the tassels to make sorghum grain. (Yes, I owe you a post on how I mill the sorghum.) 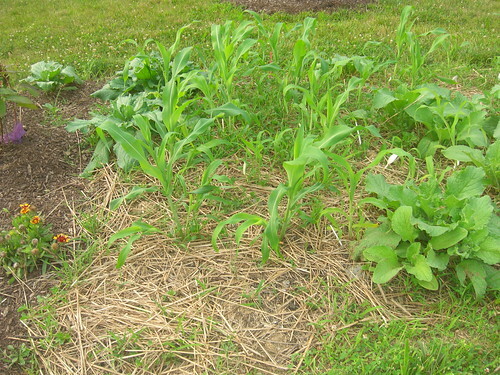 By the way, I hate mulching with straw especially when I am growing a grass like seed. Straw inevitably produces grass and you can’t tell which one is the grass and which one is the seed you planted. Have any luck with other mulches? No Fairy Godmother for Me. I Love Pumpkins! What was I thinking putting this seed at the end of my bed? Pumpkin plant ramble. Sheesh. You need alot of room for this plant. You might ask, why grow pumpkins? The ones I grow are on the smaller side because I love to use them in baking. 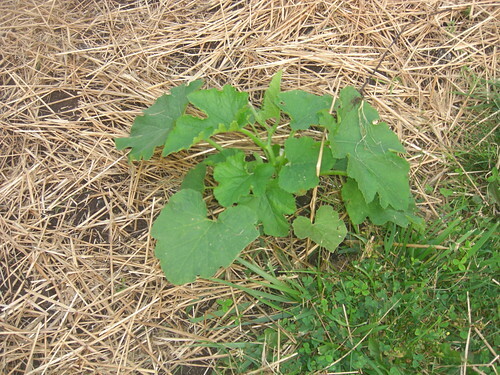 Thinking of growing squash or pumpkin? It is so easy to cook and store them for eating all winter long. In fact, I still have butternut squash sitting in my kitchen from last year! Do Y’all Love Sweet Potatoes? Yes, I think I live in the South. 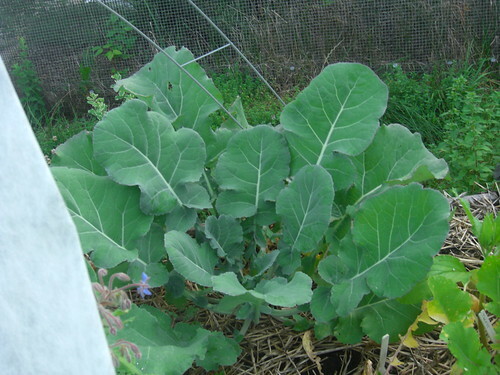 (I am also growing collard green and black eye peas.) And yes, you can grow sweet potatoes in the North. One year I grew sweet potatoes in one of my raised beds and the potatoes were skinny. I am hoping to fare better with my potato bags. 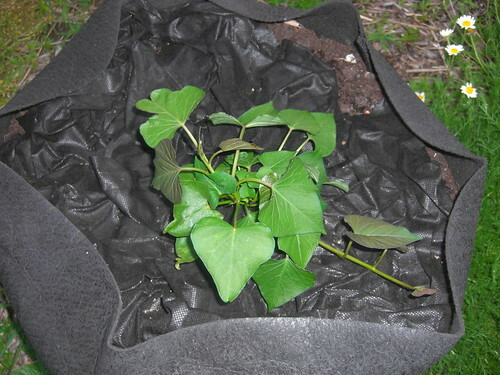 I had to show off my bags especially since Yukon potato plants are so beautiful. When in bloom, they are amassed with white flowers. Blue potatoes have blue flowers. Show stopper. This year I actually read the directions and put some fertilizer in the bags besides compost and dirt. Hopefully, I will get larger potatoes. Even if I don’t, the potatoes were still good. 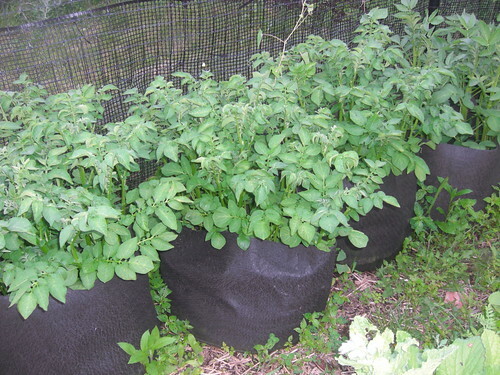 By the way, want to grow organic Yukon potatoes? I bought them here. 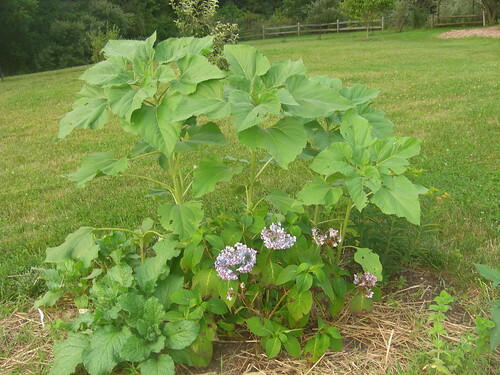 By the way, this is a great plant to grow with your kids or grandchildren. They will love searching for the potatoes in the bags. Do you grow potatoes? What about my kids? They hate my garden since they view it as work. I started gardening too late with them. Do you have the same problem? These plants look like large lentil bean plants. So cute. I happen to love garbanzo beans and especially hummus which is made of garbanzo beans. Who doesn’t love hummus? Like the Zohan (aka Don’t Mess with the Zohan,) I could eat hummus at every meal and even brush my teeth with it. For real. I don’t have girl children so I can’t commiserate with my friends who complain about how difficult it is to raise girls. But I can understand since I started trying to grow eggplant. Talk about difficult. You think I was growing Goldilocks. 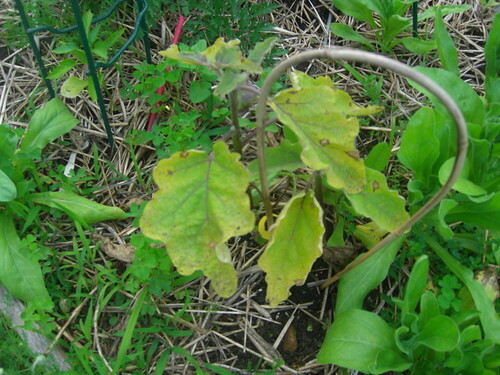 Eggplant doesn’t like it too wet, too windy, too cold, too and too. I just can’t get it right. In five years of gardening, I have only produced one eggplant while my friend produces a ton. So I am asking for an eggplant intervention. Am I being too nice too my eggplant and should I let it whine to itself? I give it fertilizer, lots of compost, and spray it with neem to keep the flea bugs from bothering it. And what do I get in return? A yellowing not so happy eggplant. I should take its cell phone away until it gets a better attitude. In fact, I am growing one in my fabulous potato bags. And that eggplant looks just as sad. Nah. Just fooling. Not even I could do this to you. I know. I feel like a grandma who can’t wait to whip out the pictures to show off her grandkids to anyone who will listen. That’s what gardening does to you. Believe me, I have lots of pictures to show you. But now I turn the conversation to you. Do you gush about your plants? Which ones are your favorites? Have any issues this year? 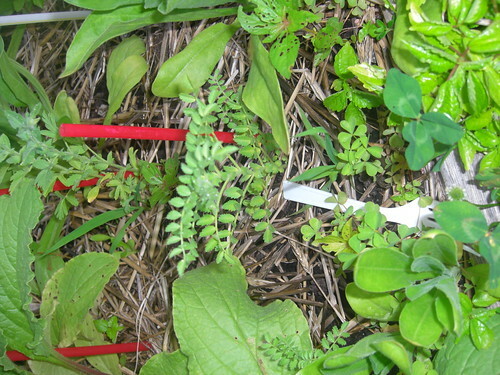 Want to pull your hair out over certain plants? How is your garden doing this year? What are you growing? Can someone please help me with my eggplant? Be sure to upload your garden pictures to Green Talk’s Facebook fan page to keep the conversation going. And don’t forget to re-tweet, google plus 1, and like this post. The more gardening conversation, the better. Disclaimer: I am a groupie of an affiliate of Gardner’s Supply. so for each purchase you make, I get to fuel my gardening obsession. Mama needs more plants.